If the Marvel Studios movies of Thor, Iron Man and Captain America are 'Mainstream Marvel', then today's announcement with Netflix for four TV series and a mini-event must be 'Marvel Knights'. 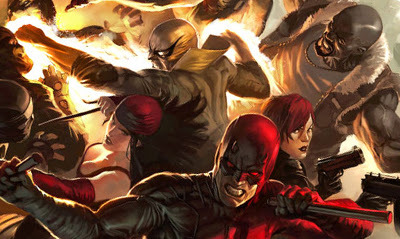 For just like the revolutionary comic imprint, the deal is not only unheralded in TV land, but spearheaded by a Daredevil series, it will bring Alias Jessica Jones, her bullet-proof ex Luke Cage and his mystical kung-fu buddy Iron Fist all into their own shows, before they unify in a The Defenders TV event, in true Marvel style. The four Marvel series set in Hell's Kitchen, New York, will kick off in 2015, with each series guaranteed at least 13 episodes. With bigger characters than Marvel's current Agents of S.H.I.E.L.D. TV series, the line produced by Marvel Television in association with ABC Television Studios, won't suffer the same perils faced by broadcast television, as it hits the audiences of the world's leading internet TV network. The idea that key elements of Ed Brubaker and Matt Fraction's Iron Fist run might make it to live action adventure, like The Immortal Weapons, makes it a dream turned hit series already in my mind. Hopefully David Aja who set the tone for many of the initial comic book issues gets to bring his unrivalled design skills to the tone of the TV show as well. Daredevil, while long rumoured for a big-screen makeover, feels more at home on TV. The law firm backdrop is modern TV's recipe for success, while thirteen episodes allows you to explore the noir culture of the Man Without Fear's gangland/ninja based cast, without being shoehorned into the one to two villains a film limitation. 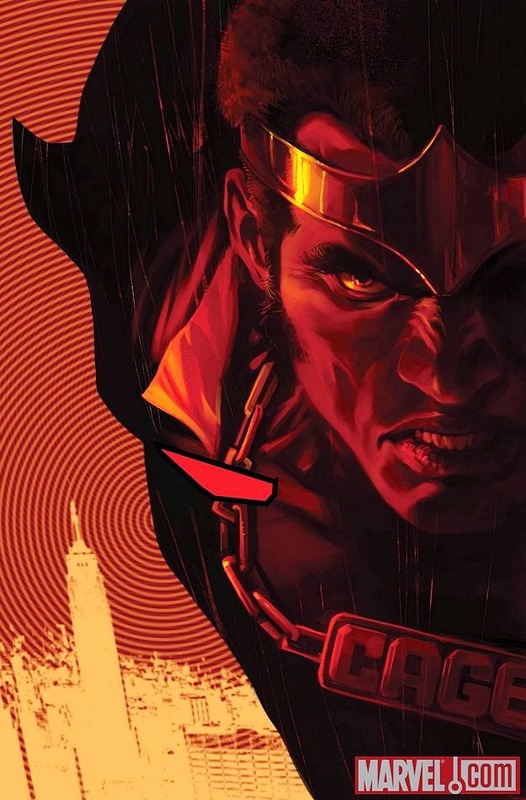 While I'm sure former super-hero turned private investigator, Jessica Jones will have similar success with her made for TV premise, Luke Cage is the one that has me screaming 'Sweet Christmas' most of all - with or without the yellow shirt, chains and afro. Handled right, the straight-talking hardman of the streets could put a dent into crime and TV history, maybe reforming some crims rhyming with 'Underbolts'? What do you think? Which is the one you are most looking forward to? THIS made me squeal. I've been in love with the netflix originals, mostly because you get all the episodes in one swoop, and can watch them when you want. Also, these characters will benefit by not being hampered by the time constraints of the big screen. This is exciting. Truly exciting. Thanks Random - I was the same. This is my preferred corner of the Marvel U, yet now all my mind can do is say 'What about Cloak and Dagger?' 'What about Shang-Chi?' and even 'What about Wonder Man?' (who I think would be great for TV). Just gotta slow down and breathe these in first. Daredevil means Typhoid Mary, means Bullseye. And Luke Cage, yellow shirt or no just means flat out cool. Well, all of them but my youngest will squeal like Random when I tell him this. Iron Fist will always be his favourite. And I agree. Wonder Man couls have a shot too. I'm not sure of actual start dates Aliera, but when I do know I'll be shoving them up here you can count on that. 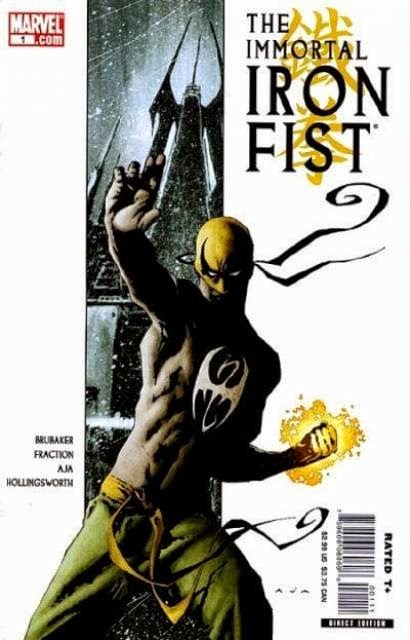 Daredevil is first, but after that I'm guessing Iron Fist will follow. Exciting times!